The important thing is that the Synod itself had the self-consciousness that it was ecumenical. This is evident in its Minutes. In the sacred Canons adopted by this Synod, many times it calls itself "ecumenical". In the 1st Canon it says: "...this holy and ecumenical Synod has decreed...." In the 2nd Canon again it says: "...this holy and ecumenical Synod...."
With such a consciousness Patriarch Photios chaired this Synod. This is why at one point he said: "Because of all that has been accomplished in this holy and ecumenical Synod, according to God's good pleasure, in cooperation with our great and high emperor, and with the inspiration and praise of the most-holy Pope of Rome, our spiritual brother and father, through the presence of his most-holy representatives, and the remaining three eastern thrones, and after the successful completion of this prayerful work has come to pass, we are bound to thank our all-good God Who loves mankind." The representatives of the Pope also called it an Ecumenical Synod. 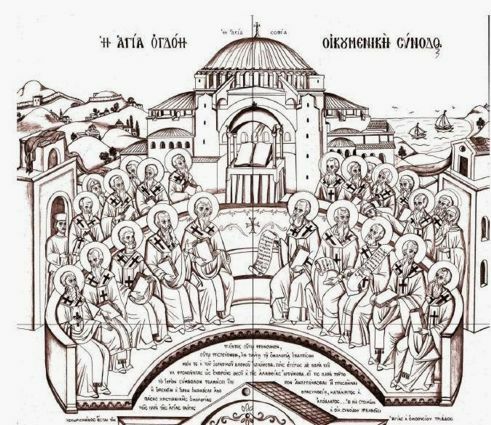 They said: "Blessed is God, for by His judgment and will all the most-holy patriarchs came together as one, and through common harmony and peace all things came to a good end from what was ruled and passed at this holy and ecumenical Synod." The entire Synod considered it to be ecumenical: "...whoever does not support what this holy and ecumenical Synod has passed, may they be separated from the holy and consubstantial Trinity." The Bishops who were present and spoke described at as an Ecumenical Synod. The phrase they used was: "According to this holy and ecumenical Synod...."
Emperor Basil was of the same opinion, which is why he ratified the Synod as follows: "In the name of the Father and of the Son and of the Holy Spirit. Basil, emperor in Christ, faithful king of the Romans, is in complete agreement with this holy and ecumenical Synod, and therefore ratifies and seals the holy and ecumenical seventh Synod, and ratifies and confirms Photios as the most-holy Patriarch of Constantinople and my spiritual father, casting away all those who write or speak against it. I sign this with my own hand." I insisted on the juxtaposition of particular passages because I wanted to clearly show what the self-consciousness of the Synod was, in that all those who were present believed that this was an Ecumenical Synod, and indeed this is what ratified the Seventh Ecumenical Synod. Beyond this I also insisted on pointing this out for another basic reason. Many Orthodox, just about the majority, speak of Seven Ecumenical Synods, without counting the Synod of 879-880 as Ecumenical, as it defines itself and as it has all the canonical and ecclesiastical conditions for it to be Ecumenical. The same happens with the Synod in the time of Saint Gregory Palamas, which is described as the Ninth Ecumenical Synod. And the West ignores the Synod under Photios of the year 879-880. While Pope John VIII voided the Synod of 869-870, which deposed Photios the Great, and ratified the Synod of 879-880, the Papal Church today recognizes the Synod of 869-870 as among their 21 "Ecumenical Synods", which is why there is no trace of a commemoration of Photios the Great among them. It is thought that this happened because the Eighth Ecumenical Synod condemned the heresy of the Filioque and did not accept the primacy of the Pope. Under such a circumstance, when some or many tolerate such an undermining of the work of Photios the Great, then one wonders: How can one honor Photios the Great, since essentially Photios is considered "anathematized" by the Papal Church, while Pope John VIII recognized him as the canonical Patriarch of Constantinople? When Pope John VIII heard that his requests were not accepted by the Synod, he sent letters to Emperor Basil and Patriarch Photios and expressed his displeasure that his representatives signed the decisions of this Synod, and he said that he did not accept the points that deviated from his mandate. Here is the theory of the Latin Church, that the Pope is above the Synods and he ratifies them or not, and in fact the Ecumenical Synod should submit to the Pope and not the Pope to the decisions of the Church, which are expressed synodically. However, things had already taken off and could not be changed. The contribution of Photios the Great with the cooperation of Emperor Basil, preserved the Orthodox faith with the condemnation of the Filioque, they distanced themselves from the danger of the penetration of the Pope into the eastern lands with the occupation of Bulgaria, and they cut off the plans of the Pope for his primacy to prevail over the Church, thus preserving the synodical constitution of the Church. Despite this, the political change of the Empire with the elevation of Leo to the throne of the Empire after the death of Basil, also had effects on the Patriarchal Throne of Constantinople. Although Leo was a student of Photios the Great, he dethroned him and elevated his brother Stephen who was 16 or 17 years old. Photios the Great spent his second exile at the Monastery of Armeniakon until the end of his life, which took place on the 6th of February in the year 891. However, whatever took place during his Patriarchate could not be changed, so that Photios the Great is considered a great wall against the storm of the western effort to change and alter the Orthodox Church. When we consider the issue from a human point of view, we can consider that, if Photios was not Patriarch at that time, with his many spiritual gifts, the Popes of Rome would have increased their ecclesiastical and political authority throughout the East, the Franks would have acquired greater authority also in the Eastern Church, with all the known consequences, since the Orthodox Church would have lost its theology and ecclesiology. However, as already mentioned, the Filioque was introduced into the Church of Old Rome in 1009, resulting in the Latins being removed from the diptychs and excommunication had begun. Photios the Great thoroughly diagnosed the mentality of the Papacy and he wanted to preserve the Orthodox Church from this alteration. The fragmentation of entire ecclesiastical regions of the western "Church" in the 16th century with the Reformation, as a reaction to the excesses of the Pope, vindicated the stance and action of Photios the Great.